Episode 1 - Research, woodwork and playing with trains. Well the time has finally come to build a model railway; I have been thinking about it for 30 years, but painting toy soldiers and building Meccano models just got in the way. 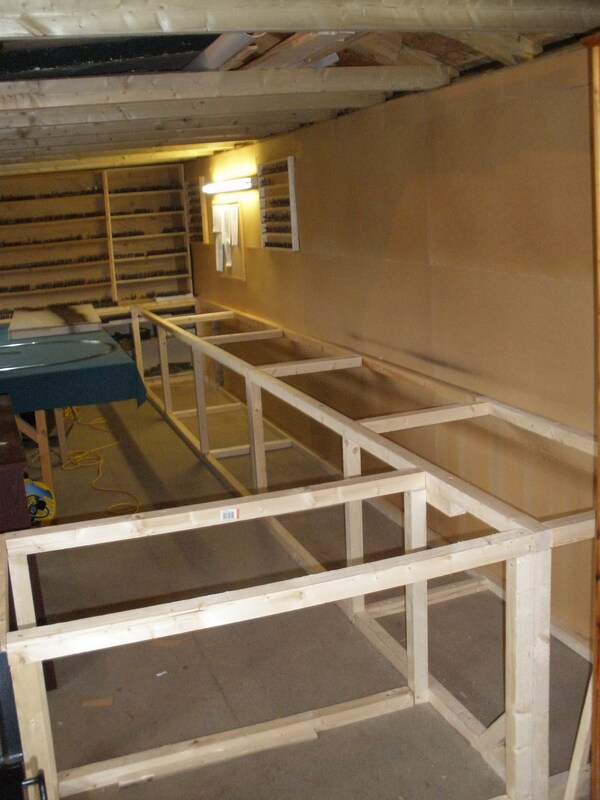 I have got a pretty big shed and taking out the the workshop area that still leaves about 20’x14’ but it will have to go round the edge because I still need the wargames table for the moment which means the first effort will be limited to 2ft wide – but probably best to start small. So first tasks is to dig out some old copies of railway magazines from the loft; several from the 80’s and 90’s found; must have been thinking about this every 10 years or so. Seems to be a few questions to answer first; what scale, what period, what method of control, what track layout, what type etc. Well the scales easy I have a OO train set in the loft somewhere anything smaller will strain my eyesight and anything bigger is way too expensive even looking at 90’s prices. And as I already have stock seems a shame not to use them; can’t vouch for the locos though they haven’t seen the light for 20 years or so. What period? Well diesel’s definitely out that’s just trucks on tracks and to be reasonably accurate electric is going to involve third rails and/or overhead wires and I can’t be faffing about with all that sort of thing. So that’s narrowed it down to steam; never been too fond of BR so that pushes it back to before 47 – will use the 30’s as a working hypothesis for the moment. What control? Dig out Freezer’s Railway wiring – read from cover to cover – put it back on shelf quickly – I’m not doing that all isolating circuits and working out what you type of frog you’ve got. That leaves digital control which seems to make sense to me because you are actually controlling locomotives rather than switching electricity to the track on and off. The latter seems mad to me if you have an alternative. What track layout? Back to Mr Freezer again and probably best to buy some 21st century magazines to look at as well. First problem is I have little imagination so its all well and good having a track plan but imagining scenery for it another thing. Probably best to pick somewhere real and get pictures to look at - copying I am good at. Back to the book shelves again – “The Somerset and Dorset then and now”, catches my eye, interesting, lots of pictures and apparently being sort of joint run by LMS and SR plenty of different loco can reasonably be used. Also LMS has some red locos which looks quite good and makes a change from green and black. 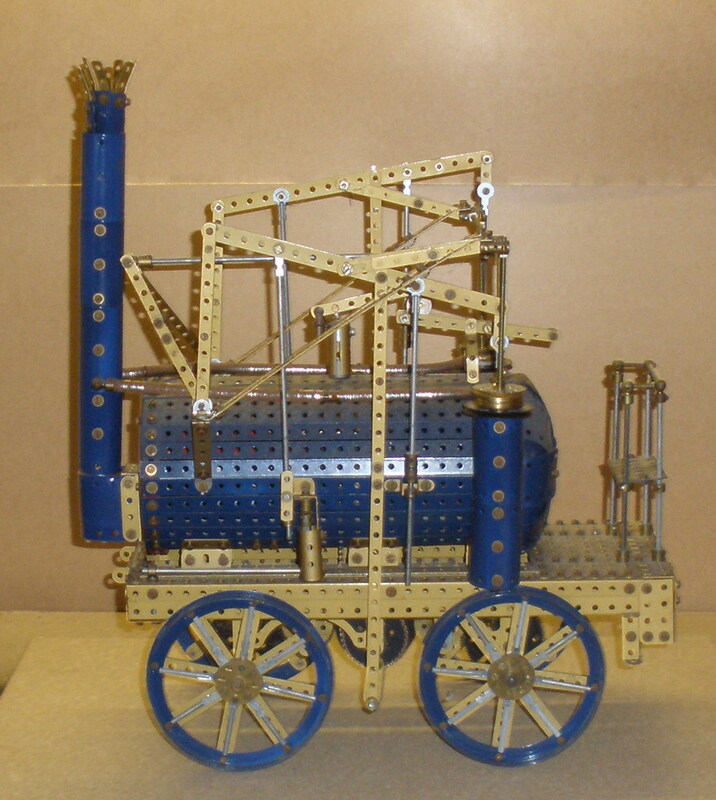 Well that enough ‘research’ for the moment I feel the need to build something involving wood – first a frame to put the model on. I decided to go round the corner to give a small hint that at some point in the future I could go all the way round. That didn’t take long, now I need some baseboard things, my wargames table is made up of 6’ x 2’ chipboard so I will nick some of that add some 2”x1” bracing and before you know it I have 2 large baseboard and having found a bit of 4’ x 2’ chipboard during the process I now have potentially 16ft of railway. I think its probably time to play with some trains – get train set out of loft. Interesting Fact 1 – The conductive properties of track that’s been in a box for 20 years is a bit crap! Interesting Fact 2 – three out of my four trains still work after 20 years in a box, good old Hornby. Interesting Fact 3 – watching trains shuffle intermittently round an oval is not very interesting. I am afraid its come to the point when I will have to spend some money – down to the local model shop in Salisbury to buy a bit of track. Now that’s better the trains fairly whiz round. OK back to the books - after reading “Dorset and Somerset” from cover to cover and looking at a rather helpful S&DJR website www.sdjr.net I have decided to do Masbury Station first – its not too big but has shunting possibilities and crucially there are quite a few pictures of it. Its got all the usual bits, a stations masters house, a signal box, a booking office a covered shelter. I may also tinker with it a bit because it doesn’t have a goods shed just an unloading platform and I want a goods shed (it is after all my layout) - I will call it Masterbury Station. Using my old track to see what fits and after much fiddling about I reckon I need about 8ft for the station, with another 7ft on one end for the fiddle yard thingy and 3ft of straight at the other going nowhere at the moment – but possibly in the future to Shepton Mallet (Shepton Hammer perhaps?). It also has a road going over a bridge at one end which will make a good place for a scenic break. Further thought on the matter lead to me thinking that a long section of straightish double track going through Windsor Hill Tunnel would be an impressive run so the 3ft going nowhere becomes 15ft to the end of the shed wall - Shepton Hammer can then fit along the end wall (eventually). Need some more baseboards for that though. Well having sorted all that out, time to play again – need to look at this DCC business, don’t want to buy anything too expensive at the moment so decide that at £90 the Dynamis System is cheap enough to play around with; I will also need some DCC loco’s to play with; not so cheap! A hunt round the internet reveals a few possible model shops close to where I live, Salisbury or where I work, Bristol – Decide the most convenient to get to is Model Railways Direct (www.modelrailwaysdirect.co.uk) near Bristol. Luckily at my first visit he has Dynamis in stock and a fair few DCC ready locos – I plump for an SR M7 and a BR T9 the latter being out of period but was weathered and looked really nice. (Note to self – will have to be careful about buying locos that look nice because they are expensive). Also have to buy a couple of decoders to fit myself – that should be fun, particularly as the Railway shop man says the M7 is a bit of a pig to fit! Also got an accessory decoder for points – seems a good idea. Got the system working at home ( the M7 was indeed a pig to fit) and you can have two loco’s on the same track running; just like it says on the box. Doesn’t matter how many loco’s it will theoretically control from one controller unless you have an oval somewhere, a human being can only control one – you can switch between locos but the stress of worrying about 2 moving locos at once is (particularly if you have and end to end layout) frankly not worth it. And also for some reason, which I can only put down to sloppy programming, you have to switch away from controlling your loco to set points – why you cannot keep controlling your loco and press the point buttons I can not imagine. This is not just Dynamis looking at other systems manuals Hornby et al you have to do it for them as well; but will have to check out all the currently available systems. So until you can introduce a computer into the system, control point using the conventional separate switching method. If you use a wireless connection between controller and base box don’t get your body in the way of the signal. If the controller loses connection with the base unit the default setting is everything stops - this is very irritating because it can happen a lot if you turn your body - answer change the default setting to not do this or after a longer time period - much better. When you stop one train with the stop button all the other stop as well (assuming you had the nerve to have more than one running) by default.You can however change this setting so pushing the button reduces the current loco to zero speed a much better idea (if you do want to stop everything you can hold the button down). The Dynamis even with the Pro box will not cater for computer control – this will probably mean my eventual choice will not be Dynamis. The Dynamis only puts out 2.3 amps so thats only about enough to run maybe 3/4 locos simultaneously without a booster.